Lightweight, compact and easy to position, the D6 is an excellent choice for miking instruments requiring extended low frequency reproduction such as kick drums, large toms and bass cabinets. The D6s transformerless design, low impedance and balanced output allow for interference-free performance. It's able to provide a huge kick drum sound with ground shaking low end while delivering exceptional clarity and attack. 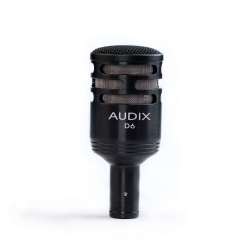 The Audix D6 is used for stage, studio and broadcast applications. Equipped with a VLM™ diaphragm for natural, accurate sound reproduction, the D6 is designed with a cardioid pickup pattern for isolation and feedback control.